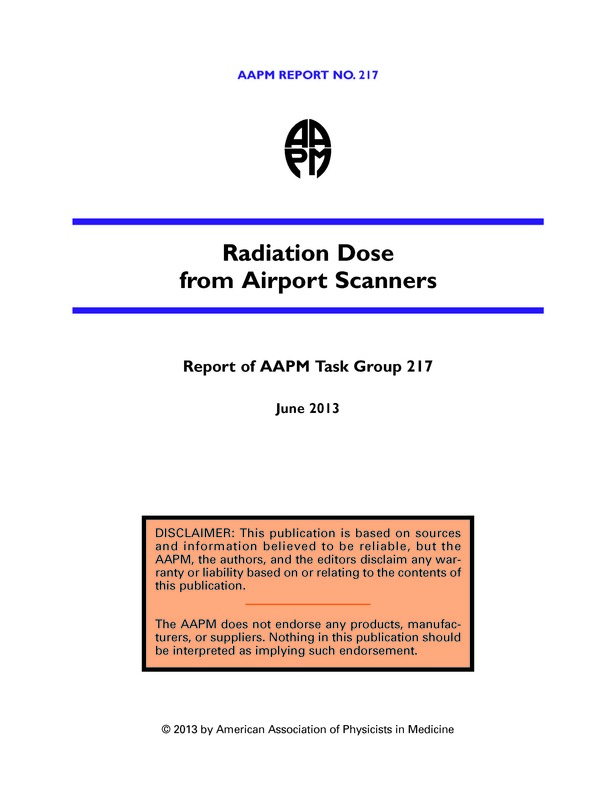 This work represents an independent study by the American Association of Physicists in Medicine (AAPM) of the x-ray backscatter systems used by the Transportation Security Administration (TSA) for screening airport passengers, the Rapiscan Secure 1000 SP. Exposure output measurements were made across multiple scanners in both the factory and in real-time use in an airport setting. From these exposure measurements, effective and organ dose calcula- tions were performed for several passenger sizes. The average corrected air kerma measurement across the systems evaluated was 0.046 µGy (for each master or slave unit which together com- prise a scanner). For a standard man of 178.6 cm (5'10") tall and 73.2 kg (161.4 pounds), the effective dose from a single-pose, two-sided scan was determined to be 11.1 nSv (nSv = 10–9Sv) and the skin dose to be 40.4 nGy (nGy = 10–9 Gy). This effective dose is equivalent to 1.8 min- utes of background dose received by the average individual in the U.S. in 2006 and is approxi- mately equivalent to 12 seconds of naturally occurring dose during an average flight.